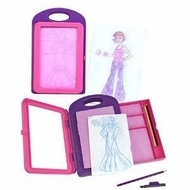 This fashion-plate rubbing set lets design-inclined kids create a wardrobe full of fabulous fashions. Just line up the pieces of an original ensemble, lay a piece of paper over the top, rub with a design crayon and . . . voila. Haute couture. Simple process with amazing results!